CrossFit—as anyone who’s had to listen to a friend talk about CrossFit knows—isn’t just a workout regiment, it’s a lifestyle, man. So naturally the workout company has followed other brands like Weight Watchers and Tom Brady in creating its own meal kit. CrossFit’s version is a bit different though: Literally, the meal kit is a box of raw organic meat. Today.com reports CrossFit has partnered with Fresh Raised Direct to offer customers a box of raw cage-free, grass-fed, organic meats—and some jerky. For $199, subscribers get a box containing five packages of cage-free chicken breasts; three pounds of ground beef; two 5-ounce tenderloin filets; two 10-ounce ribeye steaks; two 10-ounce strip steaks; two 6-ounce sirloin steaks; and a package of beef sticks. 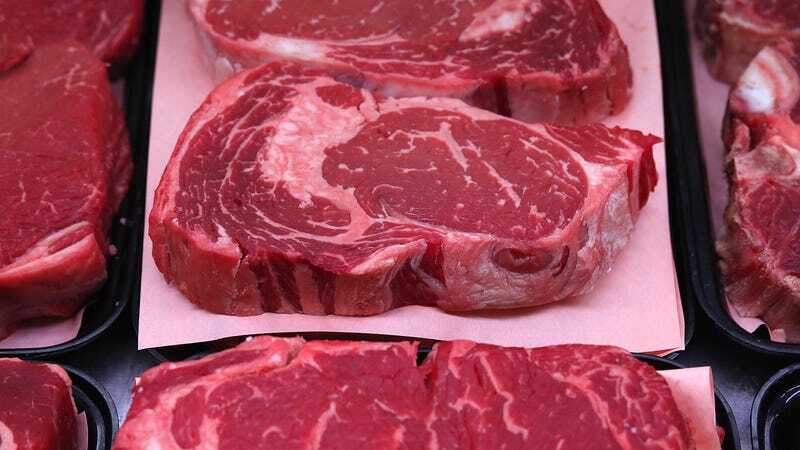 The meat promises to be 100-percent grass-fed and grass-finished; all-natural, grain-free free-range fed; lower in cholesterol, calories, and total fat than conventional meat; and rich in iron, Vitamins A, B, D, E, and omega-3. Labeling this a “meal kit” seems less accurate than calling it what it is: a meat subscription. Unless, I guess, your diet consists of a hunk of ribeye on a plate with no other garnish or accompaniment, you’re going to need a bit more... accessorizing to make this meat a full meal. And if you think the idea of a box of meat on your doorstep sounds great but you’d rather not do it via a company built on “forging elite fitness,” you can look into meat shares and meat CSAs.